The Right to Be Cold is a human story of resilience, commitment, and survival told from the unique vantage point of an Inuk woman who, in spite of many obstacles, rose from humble beginnings in the Arctic community of Kuujjuaq, Quebec—where she was raised by a single parent and grandmother and traveled by dog team in a traditional, ice-based Inuit hunting culture—to become one of the most influential and decorated environmental, cultural, and human rights advocates in the world. 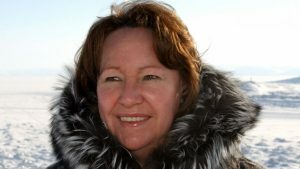 Nobel Peace Prize nominee Sheila Watt-Cloutier is in the business of transforming public opinion into public policy. Experienced in working with global decision makers for over a decade, Watt-Cloutier offers a new model for 21st century leadership. She speaks with passion and urgency on the issues of today—the environment, the economy, foreign policy, global health, and sustainability—not as separate concerns, but as a deeply interconnected whole. At a time when people are seeking solutions, direction, and a sense of hope, this global leader provides a big picture of where we are and where we’re headed. Dr. Dalee Sambo Dorough, Associate Professor at the Institute for Social & Economic Research, University of Alaska Anchorage. RECORDED: Friday, April 7, 2017 at the Hilton Hotel.